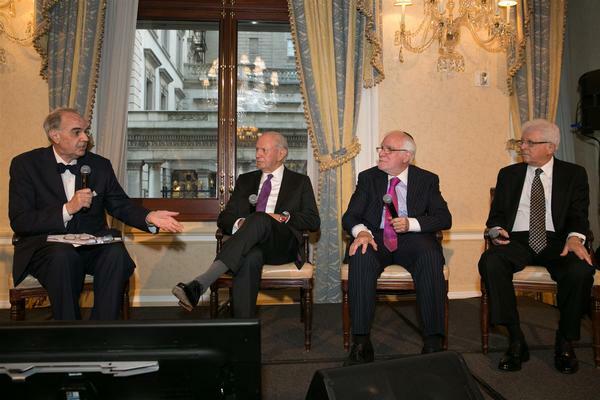 On Wednesday last week, NCSEJ held two very successful events in New York City. 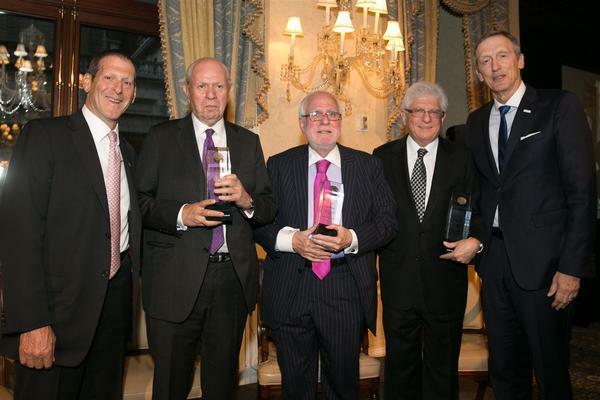 In the evening, we honored our three immediate past chairmen Ed Robin, Richard Stone, and Stephen Greenberg at NCSEJ’s “Celebrating A Decade of Leadership” event. 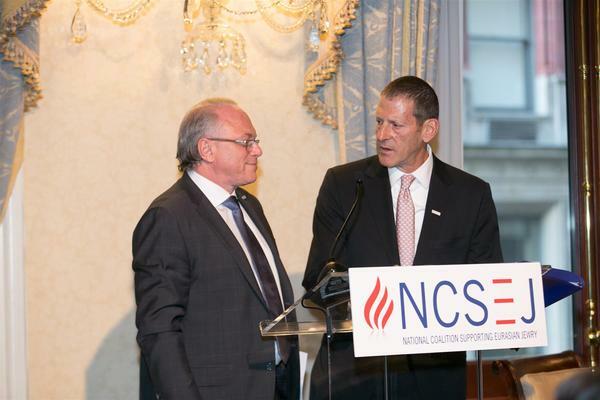 They each received NCSEJ’s “Torch of Liberty” Award, celebrating their service to the Jewish people of Eastern Europe and Eurasia. 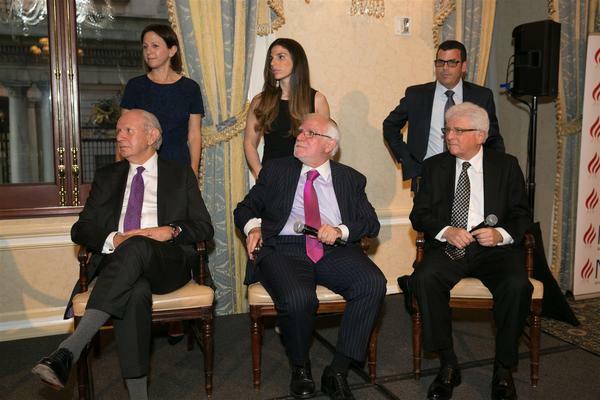 Over 180 guests attended the program, which included speeches by noted scholar Rabbi Joseph Telushkin, interviews conducted by nationally-syndicated radio host John Batchelor, and presentations by family members of the honorees. Earlier in the day, we held our Spring Board of Governors meeting, at the headquarters of the American Jewish Committee, with NCSEJ leadership, representatives from NCSEJ member organizations, and members of the diplomatic community. The meeting featured a keynote speech by U.S. Special Envoy for Holocaust Issues Tom Yazdgerdi, a conversation with Ukrainian Ambassador to the UN Volodymyr Yelchenko, a book presentation by NCSEJ President Aleksander Smukler, and briefs from Federation representatives and community leaders from Belarus and Ukraine. We will send a full summary of the day’s events soon. Evening: "Celebrating A Decade of Leadership"
WARSAW, Poland— Archaeologists in Western Poland found the foundations of the New Synagogue, which was destroyed in 1938. The ruins found in the Polish city of Wroclaw belonged to the second largest synagogue in pre-war Germany. The archaeological digs are being conducted with the financial support of German President Frank-Walter Steimeier. NOVOGRUDOK, Belarus — People in Jared Kushner’s ancestral town tend to speak very highly of President Donald Trump. That’s generally the norm in the former Soviet Union…But in Novogrudok — a picturesque city of 30,000 in western Belarus, about halfway between Minsk and Bialystok, Poland — Trump’s election is especially celebrated because it adds Kushner, the president’s son-in-law and key advisor, to the city’s short list of international success stories. A ceremony to unveil a commemorative plaque in the church on Wednesday was attended by representatives of the government and Jewish organizations, Catholic Church leaders, the diplomatic corps, and the International Raoul Wallenberg Foundation. The Church of All Saints, which is located within the perimeter of what was the city’s Jewish Ghetto during World War II, provided wide-ranging assistance to Jews. At a moving ceremony at the Sofia Central Synagogue on June 8, the Shalom Organization of the Jews in Bulgaria and the Central Israelite Spiritual Council conferred formal honours on former president Rossen Plevneliev and posthumously on Vidin Metropolitan Neofit for his role in the Bulgarian Orthodox Church’s resistance to the deportation of Bulgarian Jews to the Holocaust. The event marked the start of a campaign by Shalom and the Central Israelite Spiritual Council entitled “The Unforgotten – 75 Faces of Salvation”. The campaign focuses on the coming 75th anniversary of the prevention of the deportation of the Bulgarian Jews in 1943 and the deportation of 11 343 of their compatriots from the then-Yugoslavia and northern Greece to the Nazi death camps where six million Jews were murdered. Panevežys Jewish Community chairman Gennady Kofman and Community member Grafman attended a ceremony at the Povilas Matulionis Pre-Gymnasium in Kupiškis, Lithuania, May 30 held by the Israeli embassy to Lithuania to award the title of Righteous among the Nations posthumously to the priest Feliksas Ereminas (1890-1962). The Catholic cleric rescued the Jewish girl Rachel Rozenberg during World War II. For rescuing and further taking care of her, ambassador Amir Maimon presented Ereminas’s relative Tauras Budzys the Righteous among the Nations medallion and certificate issued by the Yad Vashem Holocaust authority in Israel. The legendary Yiddish folksinger, folklorist and teacher, Arkady Gendler, has passed away at the venerable age of 95 at his home in the Ukrainian city of Zaporozhe. Gendler helped organize the “Klezfest” festivals in Russia, which began in 1997, with the name “Klezcamp” – named after the annual weeklong klezmer convention in upstate New York. BRUSSELS -- Ukrainians are celebrating the first day of visa-free travel to most EU countries, which President Petro Poroshenko welcomed as a "a final exit of our country from the Russian Empire." The liberalized regime entered into force on June 11, allowing Ukrainian citizens who have biometric passports to enter all EU member states other than Ireland and the United Kingdom without a visa for up to 90 days during any 180-day period. It also applies to four Schengen Area countries that are not in the EU: Norway, Iceland, Liechtenstein, and Switzerland. Thousands of people had crossed the border into EU countries by midday, the Ukrainian Foreign Ministry's consular department wrote on Twitter. Thousands of demonstrators took to the streets in Moldova on June 11 to rally both for and against proposed changes to the ex-Soviet republic's electoral system that European rights experts have called "inappropriate." The Council of Europe's Venice Commission, an advisory body of constitutional law experts, is set to consider on June 16 whether to accept a study by outside experts that says the planned changes could lead to undue influence by political or business interests, Reuters reported last week. While Patrushev specifically claimed the "500 groups" were only in the European Union, by the time the Kremlin-funded media outlet Sputnik International picked up the story, they added in mention of Ukraine. But even if Ukraine is added, along with non-members of the EU in Europe, it is hard to see where Patrushev would get a number as large as 500. MOSCOW -- Riot police in Moscow and St. Petersburg have detained nearly 1,000 anticorruption protesters in Moscow and St. Petersburg, clamping down on unauthorized demonstrations organized by opposition politician Aleksei Navalny. Police detained more than 600 people at the June 12 protest on Moscow's central Tverskaya Street, according to OVD-Info, which monitors police actions at protests. Officials in St. Petersburg reported that more than 300 people were detained there.